Although the human skull is rigid and opaque, near-infrared photons can diffuse through to some degree. This enables non-invasive absorption spectroscopy of the blood in the brain. This approach, nicknamed NIRS (near-infrared spectroscopy), has been used to detect localized changes in blood oxygenation and blood volume in the brain in response to various stimuli - making it a modality worth comparing to fMRI. NIRS detects hemodynamic events in the scalp too, however. To combat this, we have developed a multi-detector scheme that helps to isolate hemodynamic trends that occur only in the brain, as opposed to the scalp. The image shows hemodynamic trends measured on a volunteer viewing a flickering checkerboard pattern (green vertical bars indicate start, black indicate stop). 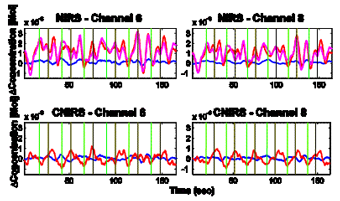 The top plots show individual NIRS channels (oxyHb in red & magenta, deoxyHb in blue); the bottom plots show the isolated trends (oxyHb in red). Stimulus-correlated hemodynamic responses are seen in the processed data. Researcher: Andrew J. Berger, Ph.D.